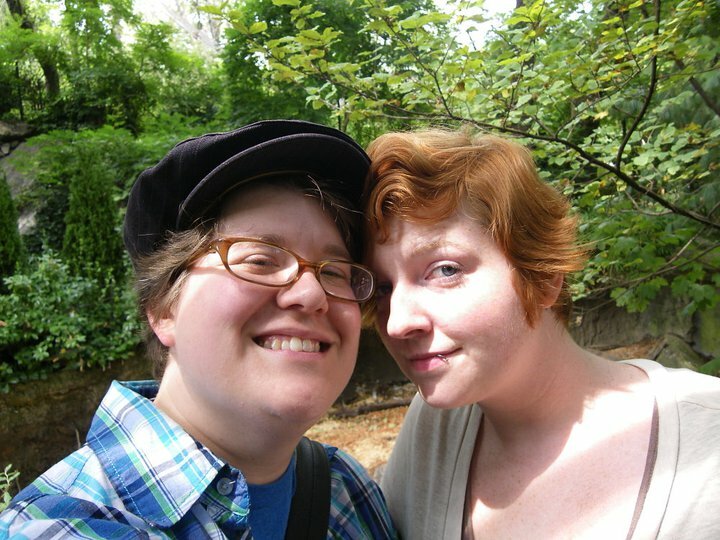 If you’ve been an Amazon for awhile you may recall Karla & Lacee’s Q & A from earlier this year. To keep the intro short and sweet: Karla and Lacee are awesome. They’re wonderful friends, good people, and have a healthy streak of self-reflection. They’re also looking to improve their level of fitness all around so they can enjoy many long years on this earth. They wrote me to share their own version of the Amazon Evolution Challenge back in early August; and since I didn’t get to it with all the wedding insanity we can also take a look at how they’ve come along in the last month. Amazons! In their natural habitat! 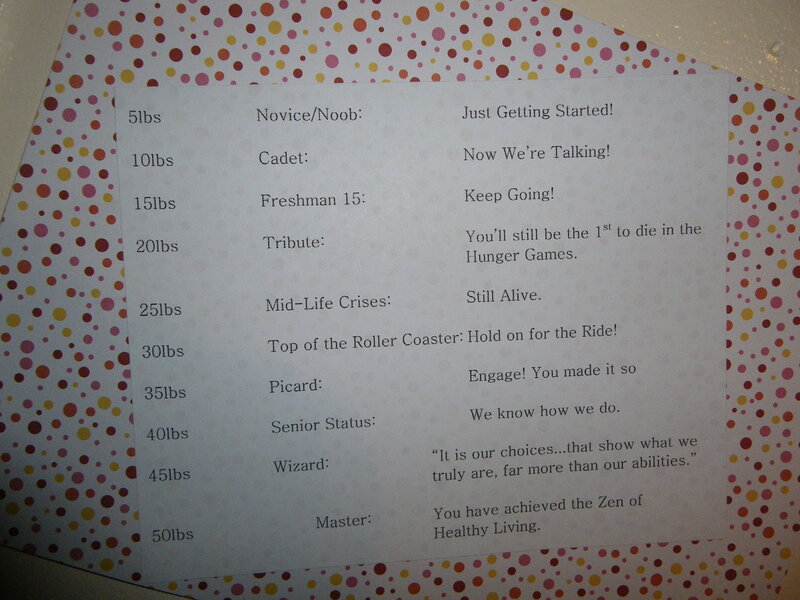 To the left is the weekly weigh-in chart (numbers blurred to protect the innocent) and to the right the levels of achievement (my favorite of which: 20 lbs of loss is a Tribute…. but they’ll still be the first to die in the Hunger Games! Hilarious. I love nerds.) I also love how they’ve decorated their charts to make them more visibly striking, obvious, and have invested time to make them more important. Right on, ladies! One significant thing that was missing from the original AE Challenge was a reward structure: the best thing about leveling up in games was always the awarding of new skills and powers. With each level we achieve in our own self-made game we’ll want to reward ourselves somehow. In the second half of K & L’s system they have some rewards; but nothing specific here. I would encourage them to add a non-food reward – perhaps with every 10lb level a new piece of clothing? Jewelry? One makes the other a playlist or gift? Anything to encourage or support one another. K & L have told me before that one of their biggest challenges has been consistently getting to the gym. Granted, when you can think of a million other things to do it’s easy to make an excuse; so their levels right now are all focused on getting workouts in. Originally they’d get a sticker for every gym visit and a bigger one for three in one week. After 15 visits you get a level and a really sweet sticker of your choosing (guess they like sticker?). As a solid household policy: no food rewards. Lacee’s commute involves a lot of walking and I’m riding my bike to one of my jobs and we just started talking about making a new rule that getting between half an hour to an hour of exercise (walking, biking, etc) in one day will earn one a new star. If we had been doing this the whole time would certainly have leveled up by now. So they’re on the right track. 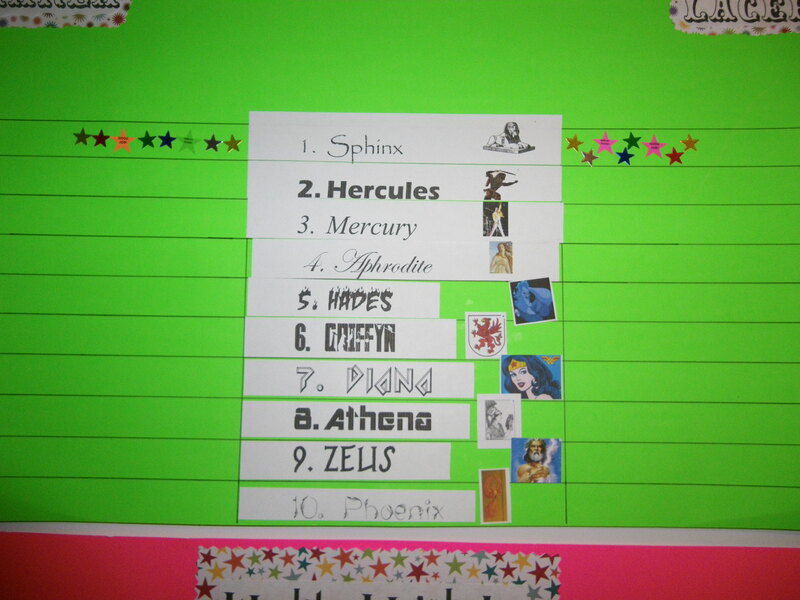 I was also proud to hear that they’ve both made progress on the pink chart, even with the lack of gym-stars; though I wont blow the horn on how many lbs they’ve thrown down. 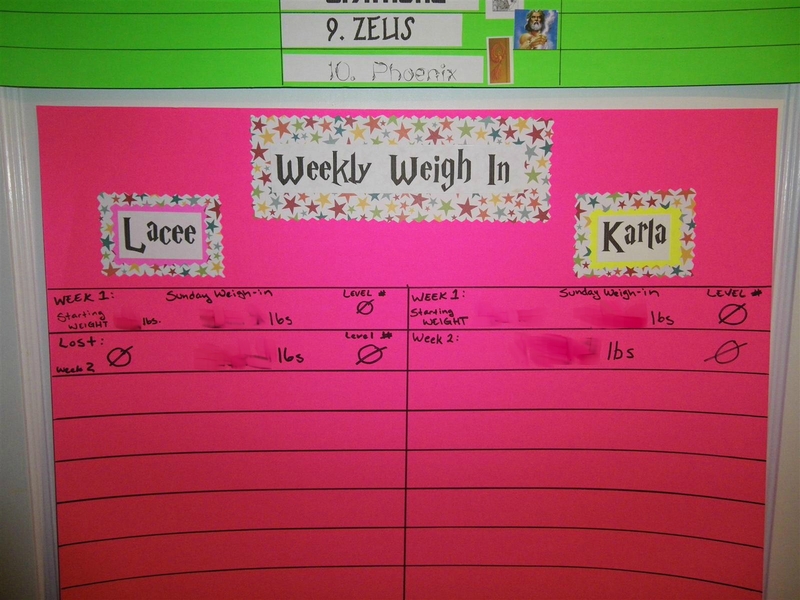 All in all I’m proud of Karla & Lacee for taking steps and making some positive reinforcement tools. Now there’s nothing to it but to do it! If you haven’t yet, Start your Own Challenge! Then email me at darleneemccullough@gmail.com and tell me all about it!